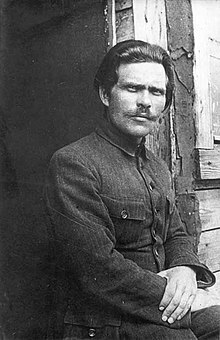 Nestor Ivanovych Makhno or Bat'ko ("Faither") Makhno (Ukrainian: Нестор Іванович Махно, Roushie: Не́стор Ива́нович Махно́; October 26, 1888 (N.S.November 7) – Julie 6, 1934) wis a Ukrainian anarcho-communist revolutionary an the commander o an independent anarchist airmy in Ukraine during the Roushie Ceevil War o 1917–1922. ↑ Skirda, Alexandre (2004). Nestor Makhno: Anarchy's Cossack. AK Press. p. 9. ISBN 1-902593-68-5. The literal translation, 'little father' does not quite capture the meaning that the word had in Ukrainian; ever since the days of the Zaporizhian Cossack communities it had implied an elected and irrevocable military leader. At the same time when being so called, Makhno was only 29 and one might doubt that he was particularly paternal or venerable; anyway there were other Bat'kos even in the Makhnovist movement and throughout the region.